Holiday meals are stressful for many people, not just those who suffer from full-blown eating disorders. However, the holiday feast doesn’t have to be an ordeal. With appropriate pre-planning, it can be managed and enjoyed. 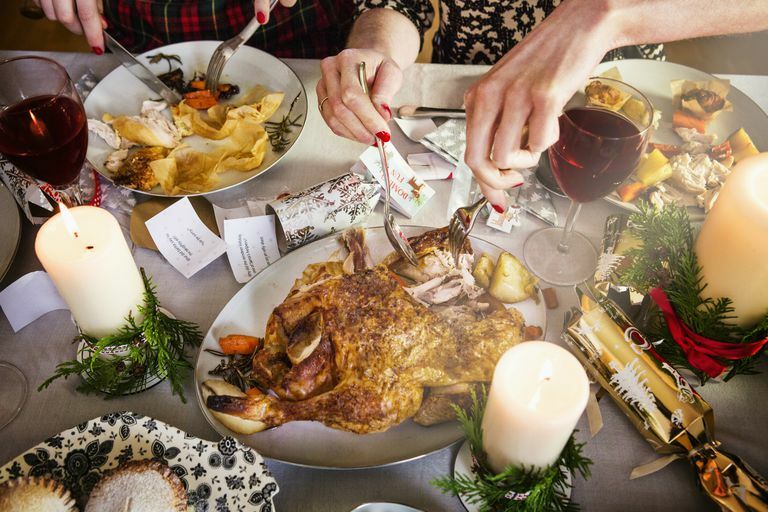 Eat normally leading up to the holiday: Most people anticipate a holiday by restricting their consumption prior to the holiday meal, in some cases for several days leading up to it. They reason that since they are going to eat a lot at dinner, they will try to conserve the day’s calories and go into the meal at a deficit. But this becomes a self-fulfilling prophecy. The more one restricts leading up to the meal, the more likely that one will overeat at the meal. Our bodies in most cases will appropriately override attempts at restriction. Lab studies have shown that when dieters are distracted from concentrating on their intake, they eat more than non-dieters. So, to avoid overeating at the holiday meal, practice the opposite of restriction: eat normally throughout the day, including a balanced lunch and a snack in the afternoon. If you don’t go into your holiday dinner famished, you will be able to make more logical and appropriate decisions and avoid overeating. Plan ahead to eat a balanced meal: If you struggle with disordered eating, it can be helpful to think about the meal ahead of time and plan specifically what you are going to eat. Families often follow a similar traditional menu every year – it is not hard to anticipate the foods that will be served and envision a balanced plate including all the major food groups (starch, protein, vegetable, fruit, dairy, and fat). Plan for a normal portion of dessert as well. Celebrations are part of life – enjoy them. If you are not sure what will be on the menu, ask the host so you can develop a plan. If it is a potluck, bring something you will enjoy eating. Reject all-or-nothing thinking: Be aware of your own black-and-white thoughts about food and challenge them. Many people actively classify their eating behavior as either “being good” or “being bad.” They reason that if they are not restricting or “being good,” they might as well just give up all control. This is a false choice that actually promotes disordered eating and holiday overindulgence. Just because it is a holiday doesn’t mean you need to overeat. Practice moderation. Remind yourself that you can eat these foods again: The belief that the holiday is the only time you’ll be able to have these foods reinforces an all-or-nothing mentality. Remind yourself that this type of food, while typical to this special occasion, can be obtained more often than that. For example, you can also enjoy leftovers the next day. You can even ask for recipes and make some of the special dishes on your own at an entirely different time of year. Do an initial walkthrough of buffets before getting food: Buffets can be especially overwhelming for those who suffer from eating disorders and disordered eating. A good strategy is to first reconnaissance the buffet without taking any food. You can view all the food and make decisions about what to take without overloading your plate. For example, choose one protein, one starch, and so on. Make and fill one complete composed plate so you keep track of the total amount of food. Seeing all of the food you intend to eat on the plate at one time will help you to keep track of how much you are eating. Do the same with dessert; survey all the desserts first and then choose one or two to eat, or consider smaller samples of a few. Pace yourself and stop when full: Try to pace yourself, pausing periodically to put your fork down and to drink a beverage. You may also want to limit your alcohol intake, as many people are more prone to overeat after drinking. Pay attention to your satiety and stop before you get too full. Sometimes it is hard to stop when eating food that tastes good. Be mindful of the feeling of disappointment you experience when you decide to stop eating something that tastes good. Sit with the feeling rather than erasing it with food; most likely it will pass in a few minutes. Accept that it’s normal to indulge on holidays: Celebrations should be enjoyed. Holiday meals are a way of connecting with others. Eating more indulgently on occasion is normal and won’t adversely affect your health. Eating in social and unfamiliar situations can be stressful for many people. Following the suggestions above can help ensure a joyful holiday.